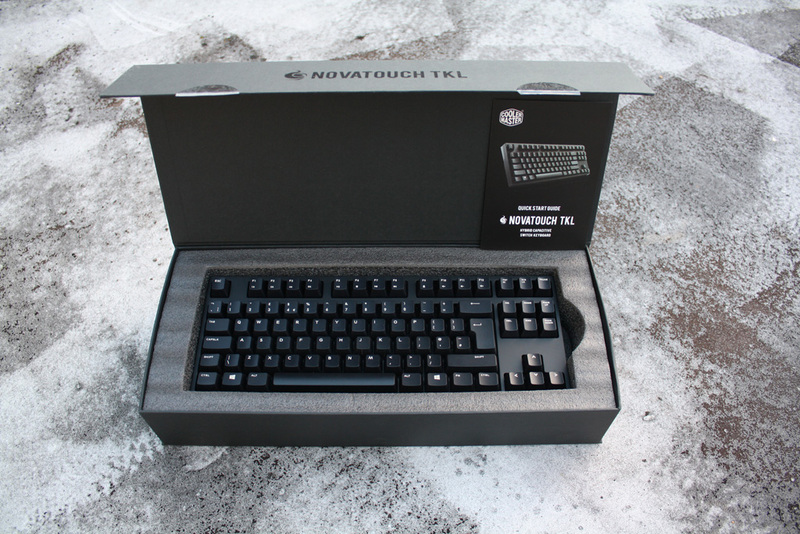 Today I’m looking at one of most exciting keyboards of 2014: the Novatouch TKL. The Novatouch is a new keyboard from Cooler Master that combines the sublime feel of Topre electro-mechanical switches with ubiquitous Cherry MX keycaps. This hybrid design means that you’ll be able to fully customise your Novatouch with the same widely available Cherry keycaps that would normally be used on a Filco or Ducky. Let’s go on and find out how well the Novatouch works. 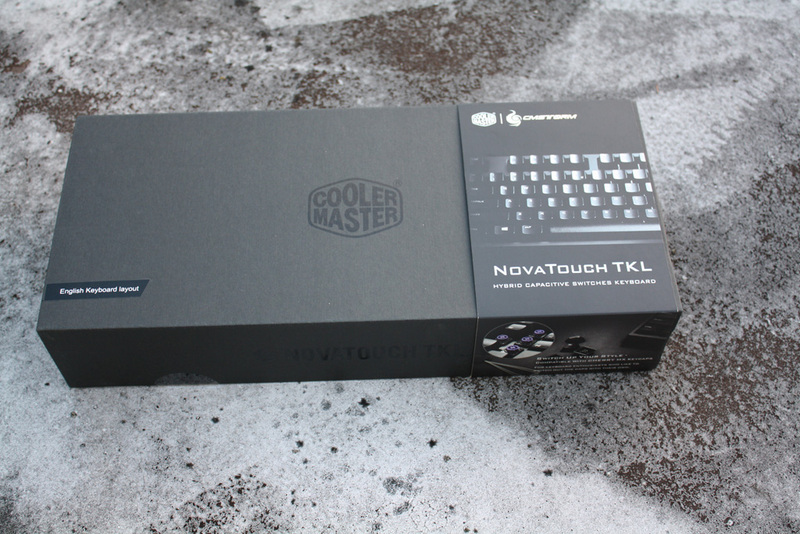 The Novatouch TKL comes in a durable black cardboard box, inscribed with the CM logo and wrapped in a sleeve that contains more information about the keyboard. You can see those purple-coloured Topre switches on the facing side of the sleeve, atop the ‘switch up your style’ tagline. 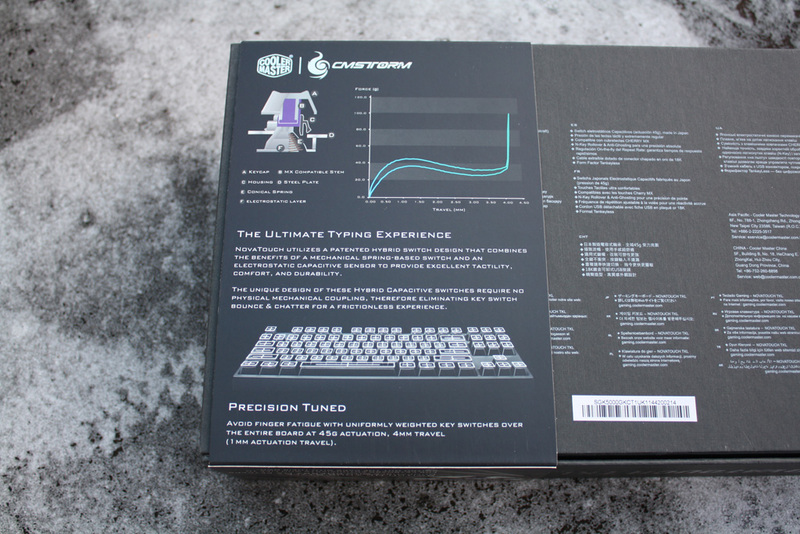 On the back we can see CM’s claims of ‘the ultimate typing experience’, which seems fair enough given the Topre switch’s legendary reputation. Opening the box now, we can see the keyboard for the first time, safely ensconced in a thick layer of foam. 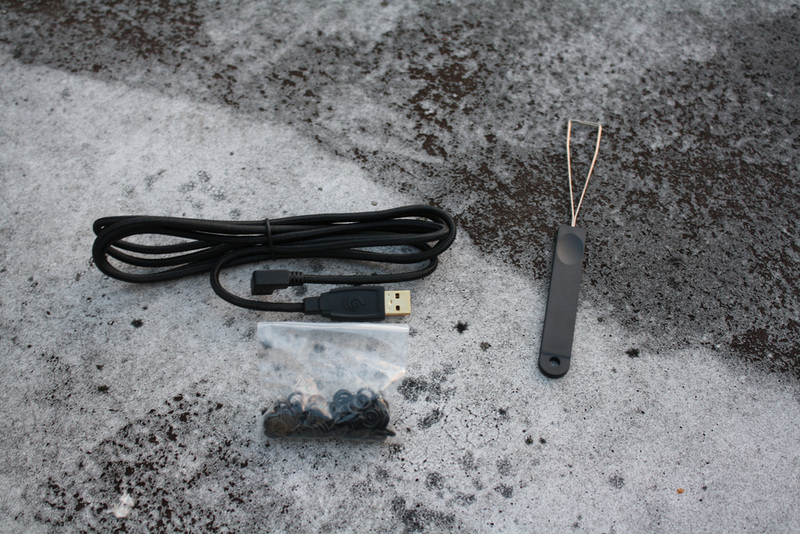 Besides the keyboard itself and some literature, we have some accoutrements: a removable braided USB cable, a wire-and-plastic key puller and a set of o-rings. The o-rings are intended to offer further customisability, by dampening the actuation of the switch and making its operation quieter. Now, let’s move onto the design of the keyboard itself! 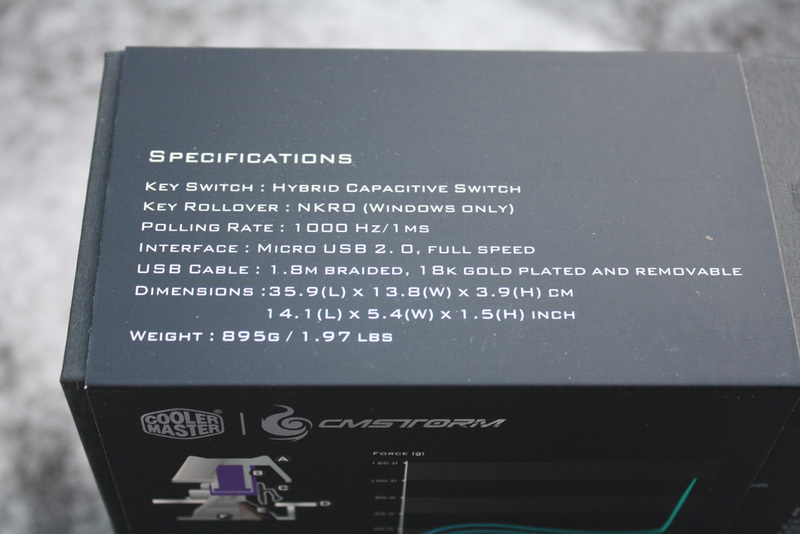 Of course, the most important part of this keyboard is that unique switch: an electro-capacitive Topre switch with a Cherry-compatible stem. 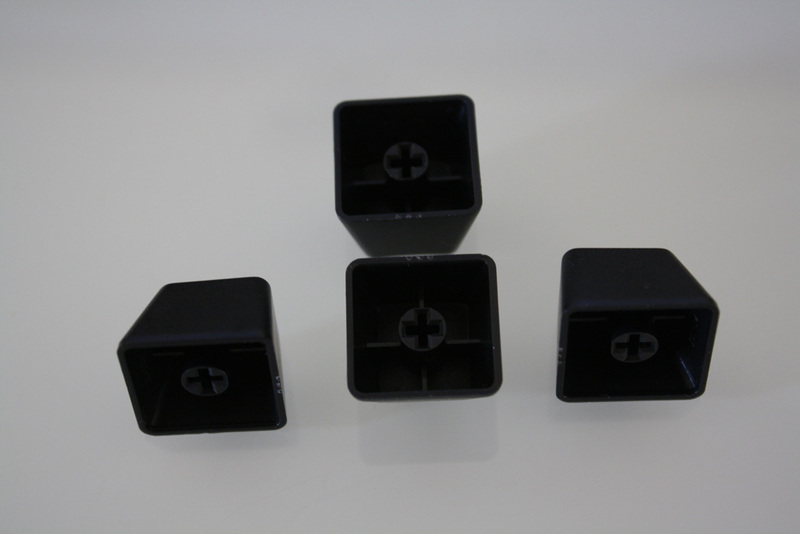 These particular Topre switches have a uniform 45 gram weighting, with a 1mm actuation point. 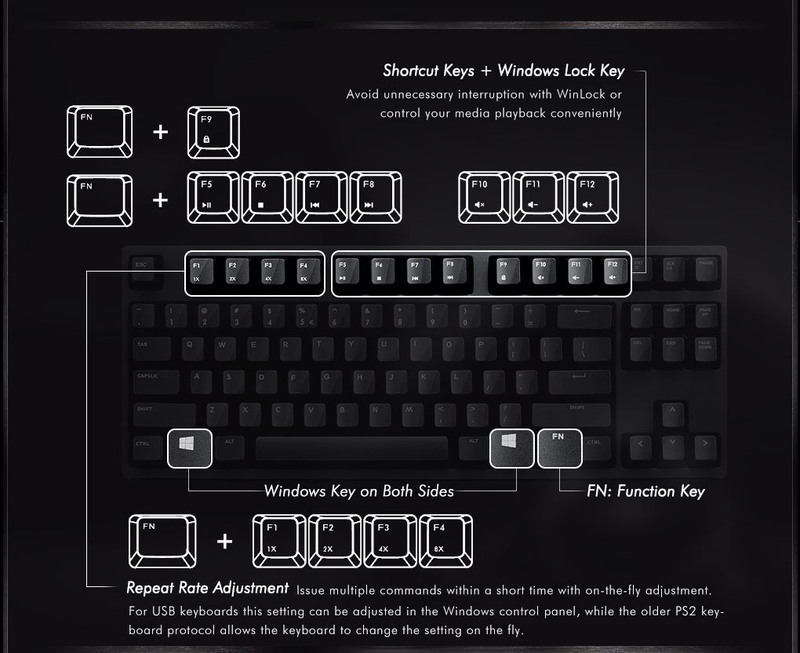 The keyboard also support NKRO (N-key rollover) on Windows, meaning that there is no limit to the number of keys that can be pressed simultaneously while still being recognised. You can see a little of how the key works thanks to this nifty Topre keychain. There’s a conical spring at the base of the switch, sitting below a rubber dome. 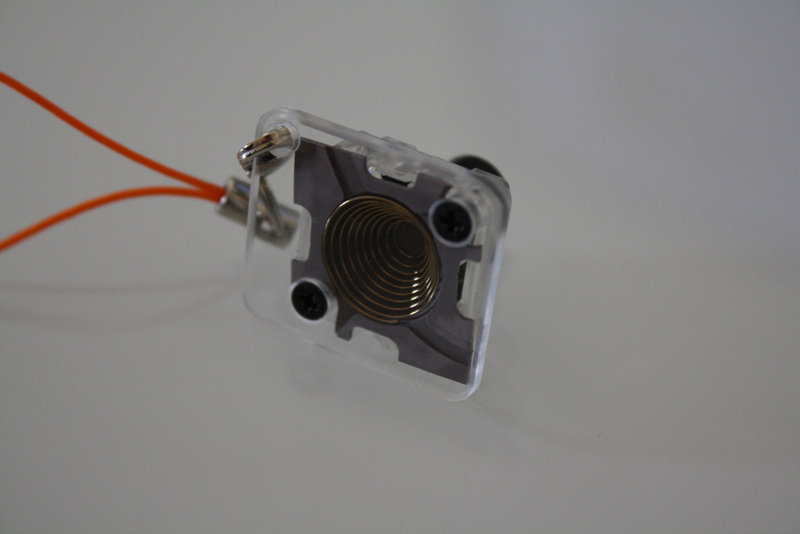 When the key is pressed down, a circuit is made and the keypress is registered. Then the key is rapidly returned to its starting position. 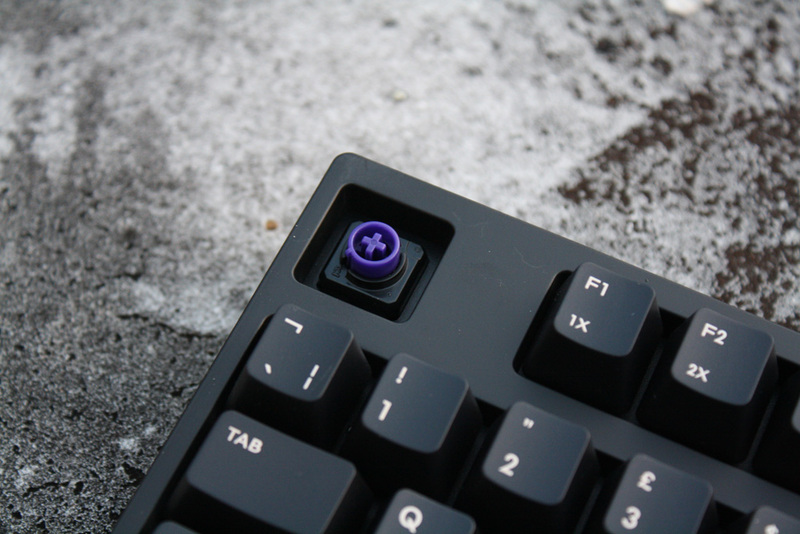 So why are Topre switches so desirable? Well, the Topre is a very smooth switch, granting some tactile feedback and a quiet ‘thunk’ sound when pressed. The feel is somewhere between a rubber dome keyboard and a Cherry or Alps mechanical switch, with a soft landing but a fast reset. Typists tend to be quite fond of Topre switches because of their smooth feel, but they can be used for gaming and other tasks as well. For more on Topre, check out our review of the Topre Type Heaven keyboard. This is a TKL keyboard, so of course we have no number pad here. Instead, the keyboard stops after the cursor and navigational clusters. This design obviously makes for a smaller and lighter keyboard, but it’s also more comfortable. That’s because your mouse arm can lie more in-line with your body, so you don’t have to adopt a wide, bowed stance. The Novatouch utilises a very standard layout, with the lone addition of a Function key amongst the modifiers on the right-hand side. This key activates additional functions along the top row. You can control your media, disable the windows key and adjust the volume. There’s even the ability to get multiple keystrokes from a single press, if you ever need to spam buttons in games for quick time events (QTEs) or for performing an attack as quickly as possible. This key repeat function can be set to 2x, 4x, 8x or 1x (back to normal) via the first four function keys. The keycaps provided with the Novatouch are made from ABS, standard for most keyboards, with a nicely legible font that resembles Futura or Spartan Classified. The keycaps aren’t bad by any means, but there is more of an expectation here than with other keyboards that you will swap the keycaps, so the originals are less important. 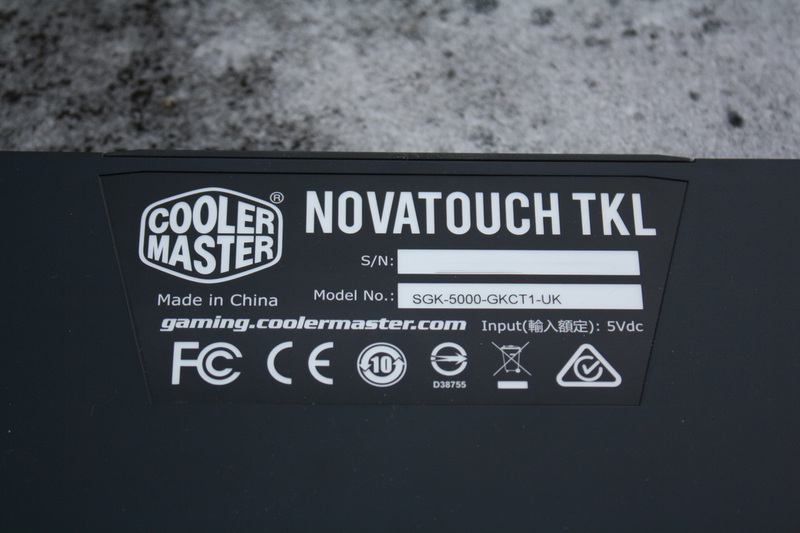 The back of the keyboard has its serial and model numbers; as you can see this is a model made in China for the UK market. It’s worth noting that there are no cable channels or DIP switches here, which can be found on some Topre models. The back of the keyboard also has a simple single-stage leg, which feels quite sturdy and props up the keyboard at a higher angle. 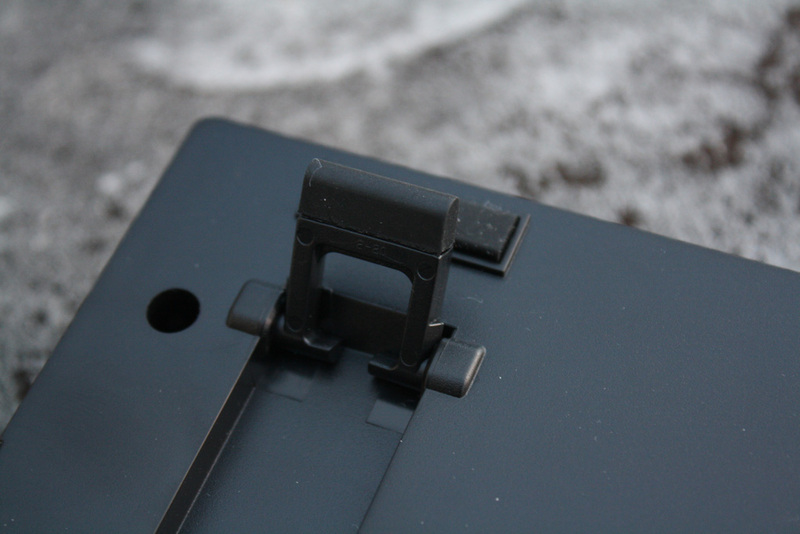 Finally, we can also see the reinforced micro USB port that you’ll use to connect your Novatouch to your PC (or smartphone / tablet via adapters). Combined with the right-angle cable, the connection should be quite durable. That’s all of the keyboard’s features covered, so let’s move onto the important part – how does it feel and how well does it work? The biggest feature of the Novatouch is installing custom keycaps, so let’s go ahead and do that! I wanted to try some PBT caps, so I took some blank PBTs from a KBT Pure Pro I had lying around. This 60% size keyboard has fewer keys than the Novatouch (and is a US model), so I opted to only transplant the letters and number rows, leaving the modifiers intact. Using the key puller provided, it took me about 10 minutes to take off the original keycaps and replace them. As promised, the Cherry MX keycaps from the Pure Pro fit perfectly onto the Novatouch. Once installed, the keyboard had a new two-tone look and PBT caps that more closely match Topre keyboards like the Realforce. 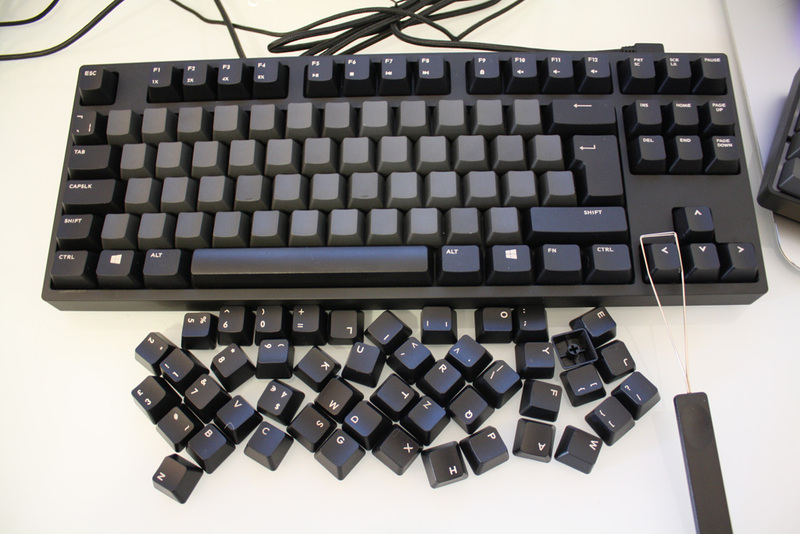 Thanks to the standard layout of the Novatouch, most TKL sets should allow for a full swap, including longer keys that require stabilisers. 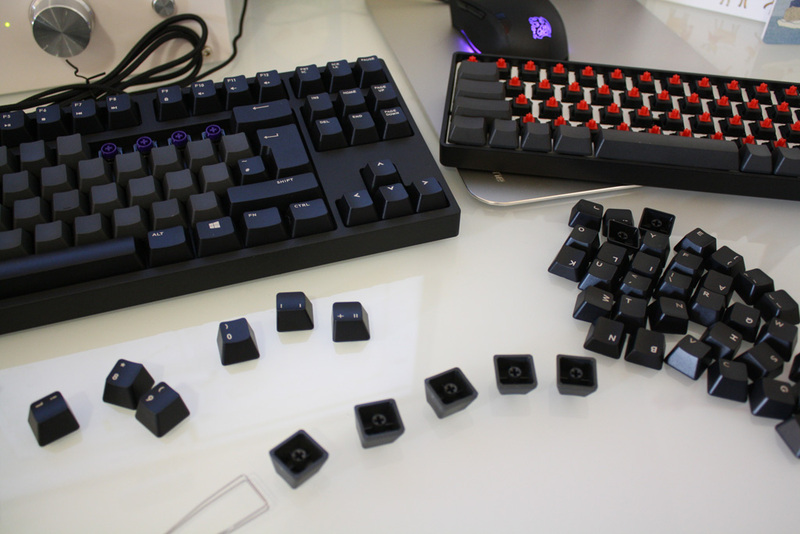 I swapped on a Backspace key with Cherry-style stabiliser fittings, and it felt quite stable (and quiet) on the Novatouch. Two things to note are the 6.25x size spacebar and the four 1x right-size modifiers (Alt, Win, Fn, Ctrl). You’ll want to find a key set that includes these size keys to do a full swap… although keeping the default black spacebar works fine with most black keysets. I tried a few keys from pretty much every set I had lying around, and everything fit well. With so many Cherry MX keycaps in circulation, the Novatouch definitely delivers on its promise of an easily customisable Topre! The Novatouch is a keyboard built for typing. The smooth force feedback curve and deep, quiet thunk of the keycaps while typing makes for a blissful typing experience. The feel is a bit odd if you’re used to sharper Cherry MX keyboards, but the feeling is certainly one that will find many fans. Novatouch ABS keycap (left), a PBT keycap (mid) and a standard Topre PBT keycap (right). With the standard keycaps, the Novatouch feels quite similar to the Topre Type Heaven. Replace the default ABS caps with PBT alternatives, and you get a feel that is much closer to a Realforce. It’s a little lighter than the Topre Realforce though, and you can feel a small difference side-by-side. Regardless of the keycaps, you’ll find a nice typing experience that offers a good insight into why Topre keyboards are so prized. The Novatouch doesn’t immediately scream ‘gamer’, but it’s a surprisingly good piece of gaming kit. The keys feel a bit like a rubber dome on the way down, but they’re lighter and rebound quickly. 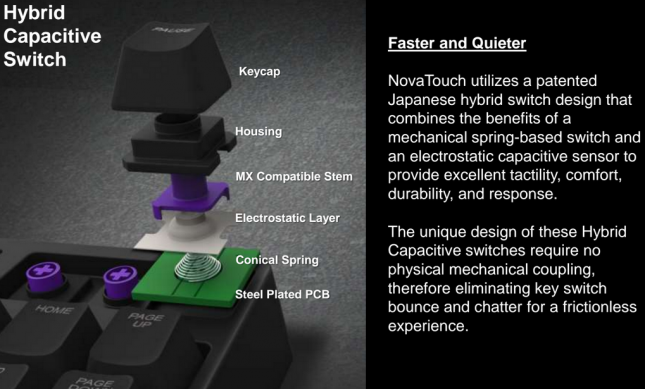 The Novatouch also includes NKRO, so you can press as many buttons as you like simultaneously and have them all register. For example, in shooters you might want to move back and left (A+S) while walking (Shift), crouching (Ctrl) and swapping to your knife (Q). I played a few matches of competitive Counter-Strike: Global Offensive, and I had no issues with the keyboard even in the most frantic of moments. 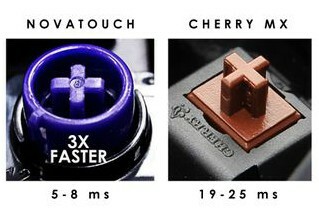 CM are also claiming a more rapid debouncing time compared to Cherry MX switches. Debouncing is a mechanism that ensures a single keypress doesn’t register as multiple presses, which naturally occurs due to the tiny oscillating nature of the keypress. In theory, a shorter debounce time would minimise the time between a key press and its interpretation… but this hasn’t been a serious issue since the 80s, and I can’t tell the difference between the Novatouch (5-8ms) and an MX keyboard (19-25ms). There are no LEDs or macro keys on the Novatouch, although you can disable the Windows key (which some gamers find quite useful to prevent accidental mid-game trips to the desktop). There’s also the option to have repeated keypresses, which was useful in games like Tomb Raider where you have to spam a key in Quick Time Events. Unfortunately, activating this function takes time so it’s not that convenient. All in all then, this is a keyboard that you can certainly game with – it would be folly to think of this keyboard as for typing only. 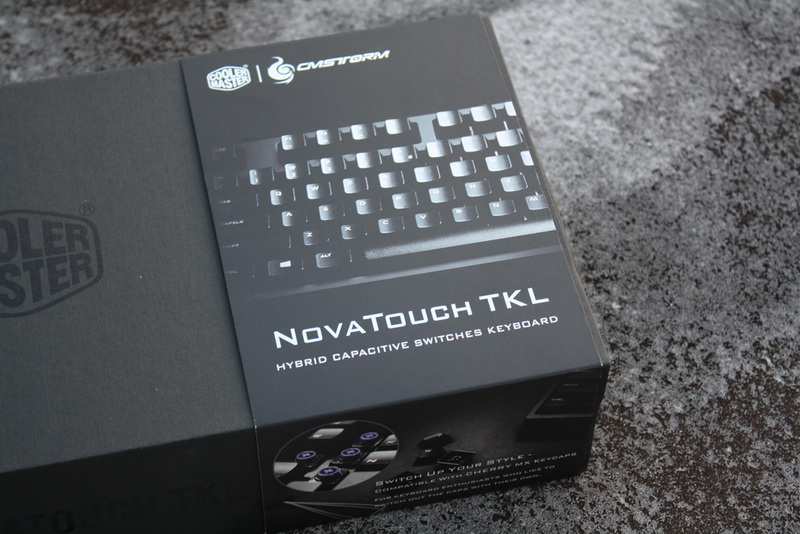 The Novatouch delivers on its promise of Topre switches on a keyboard that can be easily customised with the thousands of Cherry MX keycaps in circulation. This is the ultimate keyboard for enthusiasts who love to play with different keycaps in cool colours and different materials. It’s also a nice entry-point for Topre newcomers, so they can see what the fuss is all about. 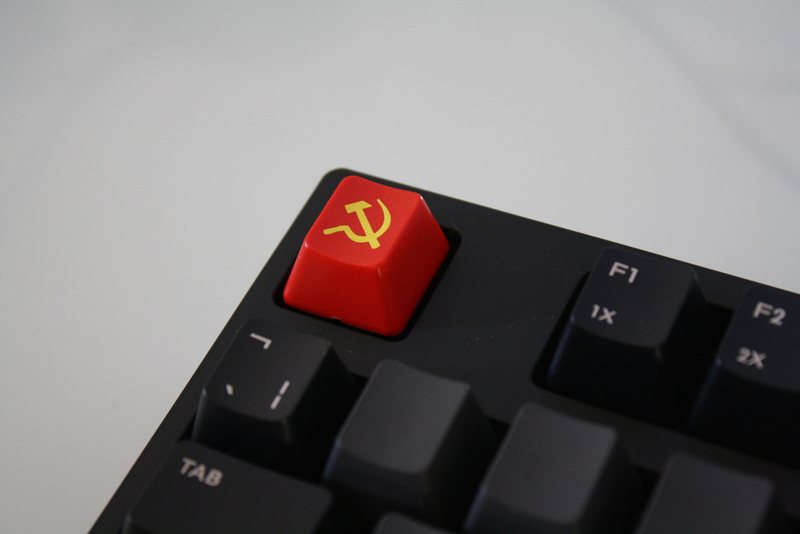 While some will find Cherry MX switches more to their tastes, typists and gamers alike can recognise the value of this unique keyboard. Please let us know what you think of the keyboard and ask us questions below! You can also reach us on Twitter @keyboardco or on Facebook. What relation does this have to the old Gateway keyboards, the anykey being the most famous, that had a very similar keystem and were also rubber dome with an additional mechanism to activate in the middle of the travel (I have no idea if it was a capacitive sensor). Is it just a similar idea or is there some connection between them? Good review. Just snagged one of these for myself, will be thoroughly testing over the course of this week… I love how quiet it is. Would like to see a 60% Novatouch! So, after a year of owning, I thought I’d post a quick review. I still love the form factor, and it’s generally held up well to daily abuse from me. One thing I did do straight away was to put duck tape around the USB connector because using Micro USB just seems an incredibly stupid decision. The printing on the OEM keycaps started to wear and I began to wear smooth patches on the most frequently used keys. This keyboard’s only used at home, so that’s not *that* much wear. The somewhat feeble surface printing has dulled and in some cases started to wear off. A bit disappointing. To that end I’ve swapped all the keycaps for a set of translucent blanktop keycaps with the letters printed on the front face. I bought the “Max Universal” Cherry MX keycap set from maxkeyboard.com (SKU “MAX132-TLB1-FRONT”) — it has pretty much every keycap, spacebar size and layout alternates that you would ever need for both letters, spacebar. enter and function keys. They fit perfectly on the MX compatible stems and the typing feel is identical to the OEM caps. I’ve got the Beer Break and Panic keys on and I LOVE how they look compared to the all-blank ISO set. This keyboard should really ship with blank keycaps as an option (a little like how the XT and TK ship with Stealth versions). The outer matte finish has worn well, no visible wearing, aside from (removeable) light marking from oily fingers – yeah, I snack by my keyboard – and it cleans easily with a damp cloth. My biggest wish was that the Micro USB connector was recessed and the supplied Micro USB cable had some kind of combination strain relief / captive lock so I wouldn’t be so paranoid about damaging the connector. Having seen the inside of the keyboard on other review articles, I know it’s actually an extension cable connected to a board-mounted connector, which is a small relief, but the design of the flushmount USB port seems like an afterthought when the rest of the keyboard’s basically well designed. The typing feel of the Topres overcomes just about all small shortcomings from the keyboard. I use it as my regular keyboard and if given the choice of an all-singing, all-dancing QuickFire XT with MX Browns (my favourite MX) or this keyboard, I’d go for this keyboard. It’s so responsive, the push feedback and lack of finger fatigue is great. My only wish is for a number pad… Oh how I miss my number pad… or at the very least an IBM-style shift feature where you could turn the rows below 789 into 456 and 123 rows. This keyboard’s 85% towards being *my* perfect keyboard. I wish I could buy a Topre hybrid capacitive keyboard with a number pad and laid out with a split ergonomic design, akin to Microsoft’s old-skool “Natural” ergonomic keyboards. I learned to type on, and used daily, an original PS/2 model for >15 years without it failing once. I still have the MS Natural board, but just this year it began to stop registering left Ctrl key pushes – annoying in games. It’s also a lot bigger than this NovaTouch TKL which sadly works against it for LAN duties, but it’s still my favourite keyboard, rubber dome membrane feel and all. As a speed typing comparison, using 10fastfingers, I can achieve about 155-160 wpm using the MS Natural keyboard. On the NovaTouch TKL, I can do about 140-145 wpm. Tested using the same 2 minute test, same words in same arrangement, repeated three times. I miss an ergonomic layout, and my hands and forearms remind me about it every day. No regrets overall about using this main keyboard for daily use when the pros outweigh the cons so dramatically. Its understated design was described by one reviewer as the “little black dress” of keyboards, and I completely agree. I have a CM Storm MECH and it looks like an aborted Transformer baby compared to this NovaTouch!